Until there is an EPL type scoring over a three or 4 year award - #1 is just a form guide and weak bragging rights that players and fans care little about as against winning series and trophies. Test cricket is not suited to tournament play - but a cycle league of even home and away would drastically change this. Only including the first 3 matches of scoring in an Ashes say would help with equal game points scorig. Won't happen - but if it did - and 3rd test dead rubbers mattered - the face of test cricket would change forever, including captaincy retirements. The EPL demonstrates fans will support a league competition with no knock outs. The time frame adds to the prestige and value of winning - like a world cup or olympic medal over a mere world championship or annual tournament. Suddenly as any arsenal or chelsea fan sympathisises - a man city vs man united fixture is of grave importance and interest. It can only add to global as against to partisan interest in cricket. Awarding the #1 sceptre every 4 years to Man United or Leicester being Australia, India, Safrica or England would be huge any ticker tape parade worthy. Think smarter ICC. This is how test cricket, every series, retains relevance and attracts wider interest. And it will regularly go down to the final few games. And it will captivate. If it was only limited to 8 team participating due to scheduling. So be it. Let Pakistan, NZ, SL, Zimbo, and Windies duke it out to relegation and guaranteed series for 4 years. I say this as a staunch NZ cricket fan. Those 4 years wouldn't mean no test cricket series - just les guaranteed matches vs Aus, Eng and India for 4 years. It doesnt end 5 test series - just makes the first 3 more pivotal. Any soccer fan, of which there are many, understands and will support their teas in leagues or cups. It works as a base model - a superbowl or world series is a bonus - not essential. True fans will support the cycle start as they do football - if NZ does a Leicester City - there will be bandwagon support in that country. Regular fan support is only increased like world cups. If someone does a Lloyd windies or Waugh aus demo job in 3 years out of 4 - so be it. People didn't stop supporting and watching man u vs man city just cos Chelsea already had won the league. Heck - pay the teams and players bonùses based on team performance and participation each round. "Your inclination to assume and contradict is typical of Narcissism which is nothing about being pretty like the Narcissus fable." Soccer, like test cricket, throws up so many draws thatcit is suited to league play. I like World Cup soccer, but sympathise to teams losing on a penalty shoot out. Which is worse than having a t20 playoff after a drawn test match to determine the winner. Like EPL - point scoring could further reward wins as against draws to encourage more exciting cricket and pose real headaches for 3rd test captains of a 4 or 5 match series. Making more global test cricket captivating. Last edited by Paddles on Wed Feb 08, 2017 7:14 pm, edited 1 time in total. Paddles wrote: Until there is an EPL type scoring over a three or 4 year award - #1 is just a form guide and weak bragging rights that players and fans care little about as against winning series and trophies. If it was only limited to 8 team participating due to scheduling. So be it. Let Pakistan, NZ, SL, Zimbo, Bangas and Windies duke it out to relegation and guaranteed series for 4 years. I say this as a staunch NZ cricket fan. Those 4 years wouldn't mean no test cricket series - just les guaranteed matches vs Aus, Eng and India for 4 years. Heck - if Bangas made the 8 - a reasonable prospect - it means more cricket for them. It doesnt end 5 test series - just makes the first 3 more pivotal. Any soccer fan, of which there are many, understands and will support their teas in leagues or cups. It works as a base model - a superbowl or world series is a bonus - not essential. Could care less NZ being #1 in t20, my thoughts on t20 not withstanding. Trophies awarding a champion for a time period mean more. Ask a tennis player what means more - winning a grand slam event or being #1 at some point. Ranking of teams in cricket is done on the basis of performance over three years period. Details have been discussed in this forum itself. So why try to reinvent the wheel without first finding out how teams get their rankings. It was discussed in this thread itself along with link. Here it is again. squarecut wrote: The ranking points are calculated based on three years performance, where the current year's performance gets more weightage than the performances of previous years. It is the same for every team. BCCI happens to have the best score at present than others. They have 120 rating point/ match based on their performance over 35 test matches (some played at home, some played abroad). It is not that a single test series makes a huge difference in one's rating point. Australia come second who are way behind at 105 rating point (based on their performance over 40 test matches in three years). The gap is huge between number one and two, and one needs to win lots of matches to have such a commanding lead over the second placed team. Victory over high ranking teams get more weigtage than win over low ranked team. One cannot become the top ranked team by only defeating lowly ranked teams. One needs to defeat high ranked teams to rise up in ranking. Here is a link http://icc-live.s3.amazonaws.com/cms/media/about_docs/536b1a832b48f-Reliance%20ICC%20Test%20Team%20Rankings%20FAQs%202014.pdf to explain how rankings are calculated. squarecut wrote: Ranking of teams in cricket is done on the basis of performance over three years period. Details have been discussed in this forum itself. So why try to reinvent the wheel without first finding out how teams get their rankings. It was time to reinvent the wheel - and the icc reasoning is identical to mine in places. The only issue I have is that a 2 year system is too short to permit necesary return series. A nation with easy tours away and strong tours at home is seriously advantaged. Imagine touring England, Ind, SA and Aus - which NZ has done in last 2 years with only Australis playing the return tour thus far. I foresee many grizzles about the 2 year qualification period. Anyone touring India in that time is not going to be content. Also unequal matches is further fuel for ill content. So good that icc is thinking - shame they're neing myopic. Mick180461 wrote: Australia will be no1 after they beat India 4-0. I am an eternal optimist but i have seen stranger things in Sport. Just a reminder of what i said 3 weeks ago. Will still be BCCI for some time. What needs to happen for BCCI to be dethroned? raja wrote: Will still be BCCI for some time. Uhmm, the whole world knows the answer to this, including the BCCI. India away tours. India has just played 13 home tests in a row this home season. 2018 will challenge India more. Away tours to Safrica, England and Australia while home tours to West Indies and Sri Lanka. India will win at home, but on the road? Australia will be the next no 1 after they beat England 5-0 for the 3rd time in 4 ashes series in Australia. Can't quite believe Smith averages 60 in test cricket. He might not hold it there I admit. Has he been minnow bashing? Boycs wrote: Can't quite believe Smith averages 60 in test cricket. 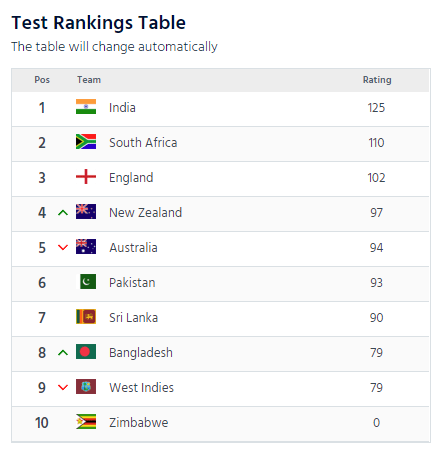 i think Australia and south Africa will move upward in the ICC Ranking. Its looks like we will number one for next 365 days as well. He might not hold it there but he will bounce back when he return from Asian sub continent. Greig Chappell last in the list. Going South wrote: rofl@australia at 5.
when are your guys going to play away from it? any time soon? I think at present no will beat Indian cricket team because at present all of there players are in awesome form. I think a couple of years no one can beat India by their rank. viraatian wrote: I think at present no will beat Indian cricket team because at present all of there players are in awesome form. I think a couple of years no one can beat India by their rank. Lets see how confident you are after the Safrica tour. When you are at top, you enjoy the moment. bask in glory. now is what matters the most. not the past. not the future. But some JEALOUS haters get happy on just a thought of BCCI not going to be #1 in a far fetching “what if” scenario that might or might not happen in future, and they get high & ejaculate now. tsk tsk. very sad indeed. IGNORE. You cannot educate such people as they have contempt for logic. PS: reply only if you are a hater or wum at your own peril. what was that smell? something is burning? All test cricket fanatics, it’s time to say only T20 ranking matters, test cricket is dead. It would save you some face. ROFL. 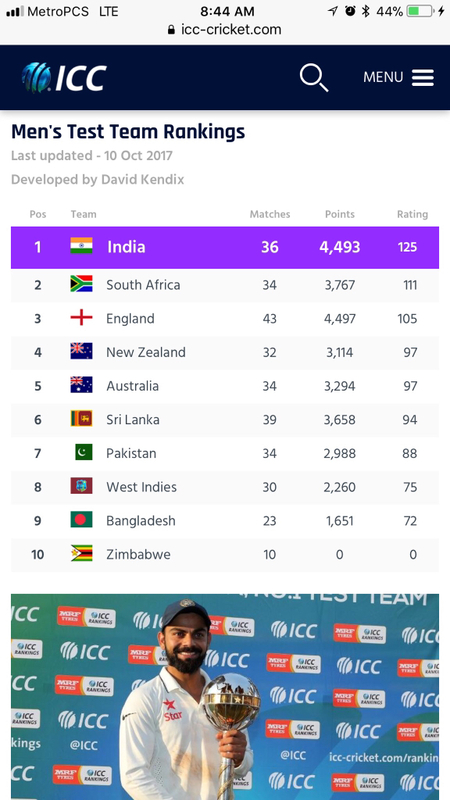 Do we have a separate thread for ICC ODI rankings? If not, am using this one. Read in the paper today that BCCI has lost its ODI No.1 ranking to South Africa. It's another matter that they could easily win it back by beating New Zealand in the upcoming ODI series at home. I think we need both for ODI & T20I ranking. The level of popularity does matter. BCCI 3, Bangladesh 3, Pakistan 2, England 1, South Africa 1, Australia 1, New Zealand 1. What needs to happen for BCCI to become No1 in T20s too? there are hardly any T20 internationals played. count the days. test match days > ODI days >>>> T20 game days that cricketers spend. it’s a very very very small sample to decide who is the best. They should be able to easily squeeze in T20 games in any schedule. BCCI needs to play more - or is it that they want to keep the novelty for the IPL? You are giving an idea to Bangladeshi fans to claim that they are the joint best in world cricket. Afghanistan's Rashid Khan Becomes The Number One Bowler In ICC ODIs And T20Is. Congrats! Jasprit Bumrah Only Indian In Top 10, Ranked 5 In T20Is. I've only vaguely heard of this guy, never seen him bowl. Not a single Aussie in the top 10. Most of these names have made their mark bowling to batsmen who cannot face spin. hahahahahaha no aussie really !!! Going South wrote: hahahahahaha no aussie really !!! last I checked our top ranked bowlers were Zampa and Faulkner. They didn't even play in the recent series. There's a bit of lag in the rankings and we chop and changed our T20 side quite a bit. Yeah, most BD fans are not the Leo kind.They will misinterpret this data to.claim they are the best in the World. Should dead rubber test matches be worth less in the ICC rankings calculations? test cricket don’t deserve ranking. in fact every test cricket loving dinosaur fan hates “ranking” in test cricket. why bother ? waste of time.